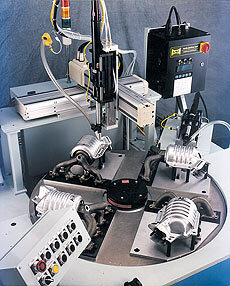 XY Robot Rotary Indexer | Automatic Fastener Feeding & Driving Equipment from Visumatic. 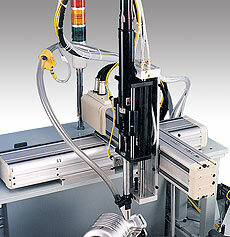 Application: Fully automated assembly system – machine loads parts, drives screws, and ejects completed assemblies. This turnkey, four-station rotary indexing assembly station drives multiple fasteners simultaneously, with horizontal and vertical heads, X-Y robots, rotary indexing tables, and with torque/angle control. Adept Robot. Easy Load. X-Y Positioning.